Symbolizing good luck and prosperity, the launching of sky lanterns is a highly anticipated ritual during many Asian wedding ceremonies. As the world is introduced to these fascinating floating lights through pop culture, brides around the world have begun incorporating the extravagant beauty of wish lanterns into their marriage rituals and unity ceremonies. Newlyweds are enchanted by the idea of watching their dreams for the future take flight on their wedding night. Guests are also mesmerized by the spectacular sight of the illuminated lanterns suspended against the starry sky. Today, lantern festivals are part of many cultural ceremonies throughout Asia, from China to Taiwan to Thailand. The dazzling tradition also has a long history in South America, particularly in Brazil and Mexico thanks to 16th-century explorers from Portugal, who likely adopted the custom after traveling through China. One source notes that sky lanterns first floated over China during New Year's celebrations in the 3rd century B.C., but Chinese military hero Zhuge Liang is generally credited with creating the flying lights. During the Three Kingdoms Era, sky lanterns were strategically used on the battlefield as an efficient means of communication. After peace settled throughout the land, everyone from peasants to royalty began using the rice paper lanterns to thank the gods for their blessings, to cast away their fears and to declare their hopes for a prosperous future. Traditionally, sky lanterns are sent into the sky with written wishes attached, ranging from prayers for a good harvest to blessings for a happy marriage to requests for relief from life's worries. In Thailand, green lanterns are lit for personal growth while purple lanterns carry dreams of opportunity to the heavens. It is believed that the longer and higher the lanterns float, the more likely the deities will receive your requests. The sky lantern ceremony has come to represent the releasing of one's deepest fears and desires. It is a symbolic cleansing, a letting go of everything that troubles you. It is also the beginning of a new, enlightened you, with the light illuminating the path of knowledge and righteousness. This deep symbolism is particularly appropriate for weddings since the newlyweds leave behind their individual courses in life to embark on a single journey together. Whether you choose to light one lantern as a couple or dozens, the thought-provoking beauty of the moment will live forever in the hearts and minds of everyone in attendance. 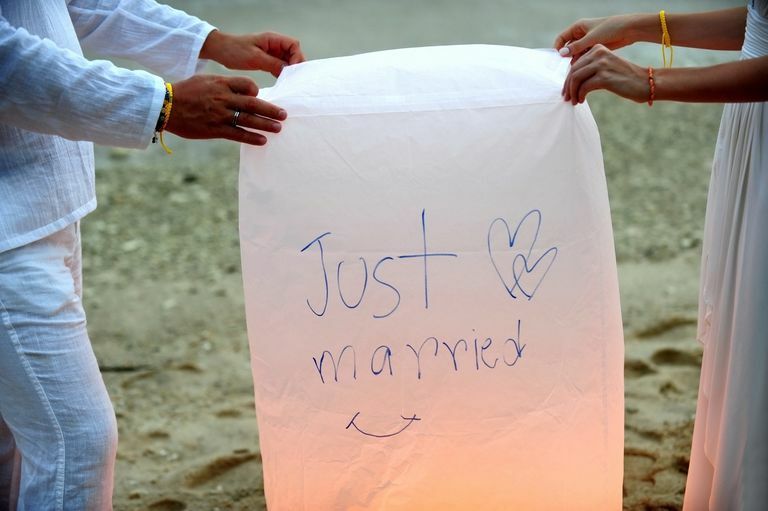 If you decide to invite your guests to launch their own floating lanterns, then make sure you provide colorful markers so they can write down their well wishes for your future. Guests could send off their lanterns as you emerge from the chapel, anytime during the reception or just as you are departing to start your new life together. It will be much easier to gather your sober guests at the beginning of the event, and having someone pre-fill the lanterns will save precious time. Since safe, environmentally-friendly floating lanterns can be a bit pricy, you might want to consider a more intimate ceremony. You can launch a lantern together as a couple at the rehearsal dinner with your closest family and friends or incorporate it into your marriage ceremony as your unity ritual after exchanging vows. If your heart is set on including everyone, but the budget is tight, consider ordering a jumbo-sized lantern for each table that everyone can decorate. Be aware that many communities ban sky lanterns due to the fire hazards they present, so you must check in with your local fire marshal to get clearance.